With a median age of 27.9 years in 2018, India is a young country. By 2020, youth will make up 34% of the country’s population. 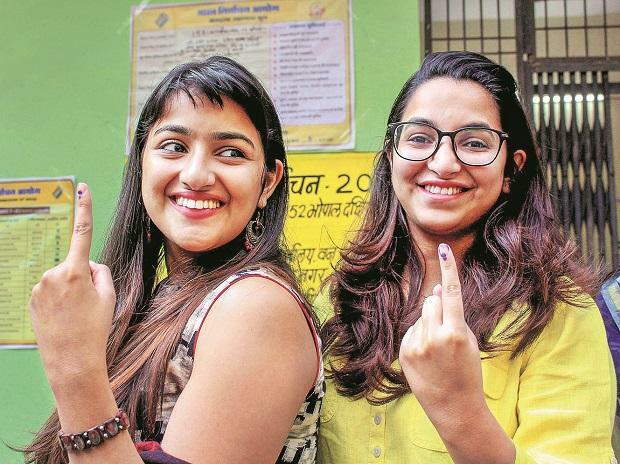 Forty-five million young people, having become eligible to vote as they turned 18, have been added to India’s electoral roll since 2014, according to 2018 data from the Election Commission. This has expanded the voter list by 5% since 2014. How India’s young population votes will clearly be one of the deciding factors in the forthcoming 2019 general elections ending the Bharatiya Janata Party’s (BJP) five-year rule. This was also the case in the 2014 general elections when 24 million new voters had joined the country’s electorate. After the previous general election in May 2014, IndiaSpend had analysed how states with the highest proportion of young people had voted. Youth had catapulted the BJP to power in the five states with the highest proportion of young voters, we found. Issues relating to the youth, education and jobs, are therefore likely to take centrestage in this election. These are both areas in need of more resources and attention in India: A pre-budget analysis by IndiaSpend established the need for more funds for higher education and better implementation of skill development schemes. Since 2000, India’s spending on higher education has been 0.73%-0.87% of the gross domestic product (GDP) and this fell to 0.62% in 2015. Enrolment for the Pradhan Mantri Kaushal Vikas Yojana (prime minister’s skill development programme) was found to be 64% short of the target set, FactChecker.in reported in January 2019. Employment will likely be the biggest issue for the young vote bank and even in the absence of latest official data on jobs, political parties cannot afford to ignore it in their manifestos. The leaked report of the National Sample Survey Office (NSSO) on employment data had shown that unemployment had reached a 45-year high at 6.1%. The government had countered that increased income tax returns filed and a leap in provident fund accounts showed a rise in jobs. Who is a ‘young’ Indian? The share of youth in India’s population had reached its maximum in 2010--35.11%, according to NSSO’s 2017 ‘Youth in India’ report. This was an estimated rise of 4.2 percentage points rise since 1971 (30.6%), from 168 million to 423 million, according to the report. The population from adolescence to middle age is defined as ‘youth’. But definitions can vary across policy agencies. The United Nations research reports typically categorise the 15- to 24-year age group as youth. The National Youth Policy in India (2003) defined youth as those between 13 and 35 years of age. Later, the National Youth Policy 2014 re-defined this age group as 15-29 years. The NSSO 68th round settled on 15-29 years for labour force participation statistics. In the latest NSSO report on youth released in 2017, the bracket went up to 15-34 years of age. Changing definitions of ‘youth’ in subsequent reports and policy outlays makes it difficult to compare data across years and age-groups. Since the latest report on employment statistics is yet to be officially released, for the purposes of our analysis, we use the data from the NSSO’s 2017 ‘Youth In India’ report. Citing 2011-12 data, this report put around 55% of men and 18% women in the 15-29 age-group in rural India in the labour force. In urban areas, the figures stood at 56% for men and 13% for women. The five Indian states that added the highest number of new voters are also among the states with the maximum seats in the Lok Sabha and rank high in terms of population. Lok Sabha seats are assigned to states in proportion to the population of the state and states with larger population hold the key to landing a majority in it, as IndiaSpend reported here and here. Of all Lok Sabha members, 43% will be elected from the top five states that added the highest number of new voters: Bihar, West Bengal, Rajasthan, Maharashtra and Uttar Pradesh. In four of these five states--West Bengal voted for the Trinamool Congress--the incumbent BJP was the top party in the previous Lok Sabha elections. Note: Vote shares of parties do not add up to 100 because only seat-winning parties are included in the list. After its big 2014 win, BJP also won the Maharashtra state elections. The alliance between Janata Dal (United) and Rashtriya Janata Dal (RJD) won the assembly elections in Bihar in 2015 but it was a short-lived partnership. The state continued to be ruled by the JD(U) led by Nitish Kumar after the RJD walked out. Bihar’s political parties have started calculating the likely permutations for the Mahagatbandhan (grand alliance of parties) for the soon-to-be-declared Lok Sabha polls in 2019. In Uttar Pradesh, the BJP won the 2014 Lok Sabha with a 43% vote share and 71 seats, and it won the state elections in 2017. The Samajwadi Party, under the leadership of Akhilesh Yadav, and the Bahujan Samaj Party under Mayawati have formed an alliance to fight the BJP in the state for the 2019 general elections. The BJP won all the 25 Lok Sabha seats in Rajasthan in 2014 but lost to the Congress in the state assembly polls in December 2018. In West Bengal, the BJP managed to gain a 17% vote share in the 2014 general assembly elections though the party won only two seats. It is now set for a battle with the Trinamool Congress in the 2019 national elections. In a first-past-the-post system, where the candidate (or party) with the highest vote share wins the seat, a swing of a few hundred votes can sometimes affect election results. With a strength of 13% new voters in states such as Bihar, young voters can decide election outcomes. Here is why: The Lok Janashakti Party (LJP) has only a 7% vote share in the state, but won six seats. Whereas JD(U) and RJD won fewer seats in the Lok Sabha (2 and 4 seats, respectively), their vote shares were much higher than LJP’s. JD(U) had 16% and RJD 21% vote share which they managed to convert to seat-share in the state assembly polls, as IndiaSpend reported November 2015. Our analysis shows that political parties can, by concentrating on the top five states that have added the highest number of new voters, potentially increase their chances to win more seats in the Lok Sabha. These states are also among the most populous in India and any party or coalition winning more seats here can form the government at the Centre, as IndiaSpend reported in May 2016. Of the total Lok Sabha seats, 211 (37%) come from the top ten states that have added the highest proportion of new voters to the electoral roll since the last general election of 2014. Note: Union territories and smaller states that send one or two members to the Lok Sabha have not been considered for this analysis. Skill development, higher education opportunities and jobs are going to be priority issues from states with highest shares of young population. Parties have started working out vote share-seat share calculations in their alliances as the youth wait for parties to declare their complete manifestos. Mumbai: With a median age of 27.9 years in 2018, India is a young country. By 2020, youth will make up 34% of the country’s population. Forty-five million young people, having become eligible to vote as they turned 18, have been added to India’s electoral roll since 2014, according to 2018 data from the Election Commission. This has expanded the voter list by 5% since 2014. (Tewari is a PhD Scholar at the School of Development Studies, Tata Institute of Social Sciences, Mumbai, and an IndiaSpend contributor.) Republished with permission from IndiaSpend. You can read the original article here.